Home / Articles / Have We Sacrificed Service For Progress? Have We Sacrificed Service For Progress? We have all strived to become better at our craft, or else, I’m assuming, you wouldn’t be reading this! With each new nugget of wisdom and learned lesson, we apply it, whatever “it”may be (when necessary;) thus giving us more tools to service our guest with…Sounds easy right? If only it were that simple. Think about it. When we first started bartending, aside from learning the cocktails, we were “learning” our guests. Their names, what they drink, what they do for a living; and interacting with them on a more personal level. Pouring a shot and a beer while making small talk, and calling it a day. Easy! 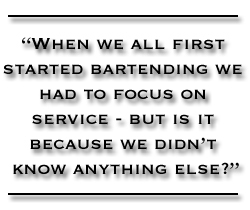 When we all first started bartending we had to focus on service – but is it because we didn’t know anything else? We knew all of the regulars’ names, had their drink waiting for them when they walked in, and probably even caused a few relationships and marriage proposals! Our guests came to the bar to visit us and enjoyed feeling “special” by the level of attention and service we gave them. Life behind the bar wasn’t that involved and didn’t take up as much TIME as it does now in most of our lives. Now we fast forward a few years. Today, most of us are responsible for creating some signature craft cocktails while at work – TIME goes into making those. 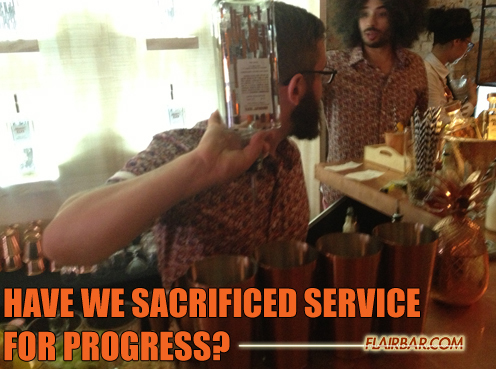 Some of us perform Flair while behind the bar; TIME goes into that. Some of us are applying new techniques behind the bar, such as utilizing molecular mixology behind the bar. TIME goes into that. Some of us are offering craft ice for our craft cocktails, and we all know TIME goes into that. Some of us are smoking cocktails for our guests… TIME goes into that. I ask you, with all of this TIME being taken to do these amazing things, where has the TIME gone for investing our attention in our guests? 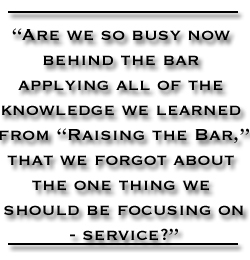 Are we so busy now behind the bar applying all of the knowledge we learned from “Raising the Bar,”that we forgot about the one thing we should be focusing on – service? I love sharing knowledge with other bartenders and my guests, but I have to be honest: when I’m slammed on a Saturday night, torching thyme for a cocktail, while stirring a Manhattan, knocking out six shots of Fireball, and a guests asks me,“what are you making that’s on fire?”…I honestly don’t go into detail or answer them with the same education of the process as I would if we were slow, let alone as much as I would have as when I first started bartending. #TRUTH. 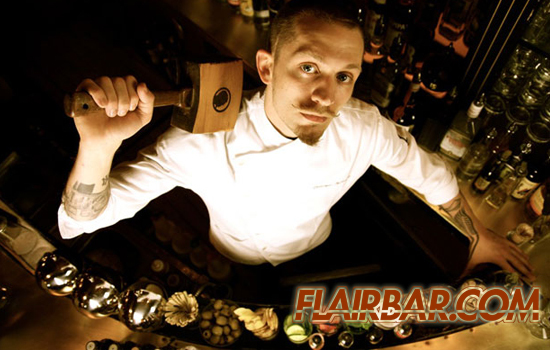 Now of course the argument could be made that by applying this heightened level of techniques behind the bar, you are giving better service by offering the guests better quality cocktails, and that the exciting Flair being done while making their cocktails brings value to the guests’ hard earned money; providing them with a “better experience”as a whole. Whether you agree or disagree, I believe there is no “right or wrong,”because the thought that provokes this discussion is more of a double edged sword, so to speak. On one side, all of these factors add TIME to what we are doing behind the bar. On the other side, they definitely add VALUE to what we are doing. So I guess the real task here is much like any good cocktail…Find that balance. When we first started out bartending, we had plenty of time on our hands – making shots and beers for our guests, and getting to know them during the slow shifts. Now that we have progressed to a better, more evolved bartender, working the busy shifts and having less time on our hands, we have to make more TIME for service. Your guests don’t always need to see that amazing 4 bottle working Flair sequence, or that crazy new barrel aged Clover Club with a Earl Grey foam with torched sugar rim. Sometimes they just want a beer and a shot…And that’s ok! It gives you more TIME to get to know them again, and by doing this, give better service to your guests.